I just saw this collection over at Freshly Blended (great blog!) and it is TOO GOOD to not post here. I wish I could have every one of these dresses. I am sad that the designer and store is located in Brazil. Illustrator/designer Catatlina Estrada launches a fashion collaboration for Brazilian fashion brand Anunciaçao's summer 2010 collection. Clothes were designed by Maria Elvira Corsara and pictures were taken by photographer Pancho Tolchinsky. BUY ONE GET ONE FREE ON ALL NOTECARDS AND FLATCARDS! Free item will be the same as the purchased item. Great time to stock up on some fabulous and fun stationery to write all your friends with! Offer ends Sunday, August 30th at 9PM central time. Check what that means for you here. Mitchell you can fool us once... you can fool us twice... ER WHAT? I can't believe that Mitchell squeaked by again! I am personally annoyed when a designer gets kicked off just because of poor construction, especially when it is a great design, but two times in a row poor showing. Bummer! Glad to see my TWO MINNESOTA boys still rockin it out! 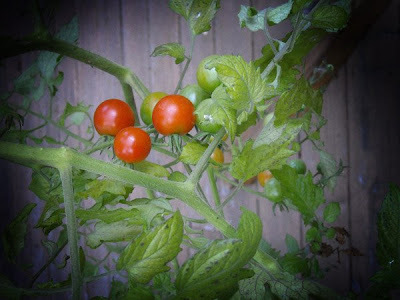 If you have followed my blog, you will know that I have a TON of tomatoes on my deck right now. I have been scouring the web to find quick and easy recipes for the tomatoes and other ingredients & spices I have laying around. Tonight I found this recipe and to go with it I pan seared a chicken breast in olive oil and balsamic vinegar- Delicious! 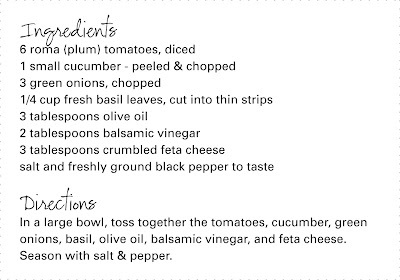 The recipe is from All Recipes and it is posted above so you can print out on recipe cards and keep in your kitchen! Illustrator Helen Dardik has been a favorite of mine for some time. I love her fun, young, retro, and whimsical style. Some of my favorites she has done are from when she started experimenting with watercolor- what an effect! 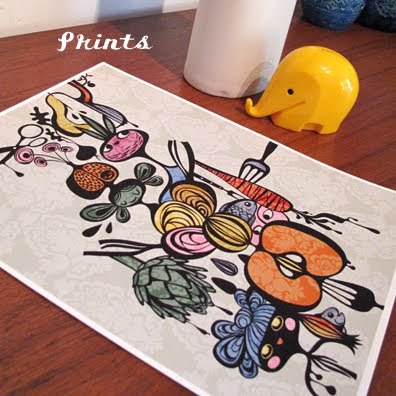 She has a really fun blog, Orange You Lucky!, that I read daily as well as a great website, One Lucky Helen, where you can view her illustrations, patterns and art. 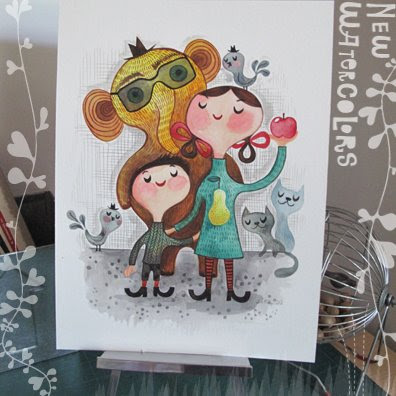 She even has an etsy shop where she now sells some of her prints! I can't wait to get a few some day- they would really add a splash of color to any room! Kate Spades new clothing line debuted a little bit ago and all I can say is wowza! I am not a big fan of some of her handbags as they are a bit preppy for me, but this line of clothes has a great sense of trendy prep with bold graphics and bright hues. If I could afford it- I would be first in line to grab some of these pieces and start layering! Of course I would pick up that owl bag (Go KKG!) AND a pair of these shoes too.... HOT! This friday I have a great FREE download for you all! 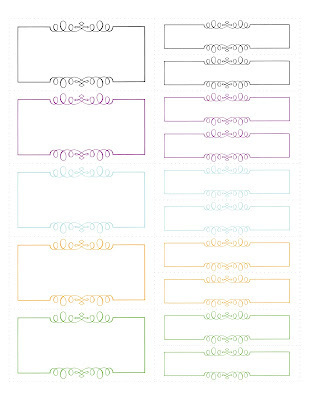 Download these labels, print out on label paper, trim and stick to your hearts desire! 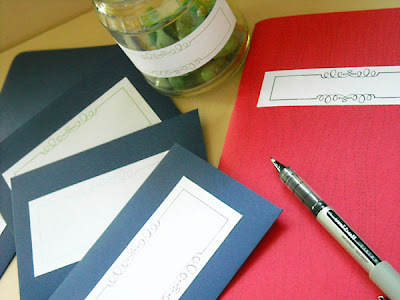 I used them here on envelopes, a notebook and a jar of beads. There is really no limit to what you can label and organize! The labels are 2x4 inches and 1x4 inches. Just click the image to the left to enlarge, right click (PC) to save to your desktop or you can drag and drop (MAC)! 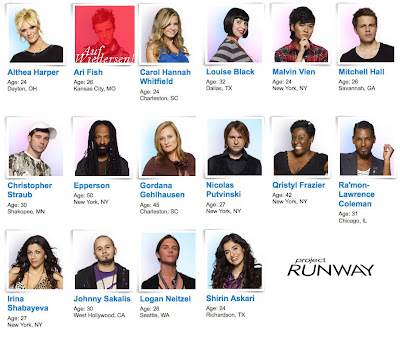 Project Runway has to be one of my favorite shows. I am so happy the newest season is finally premiering tonight! There are even TWO contestants from Minnesota! I can't wait to see if they are any good! 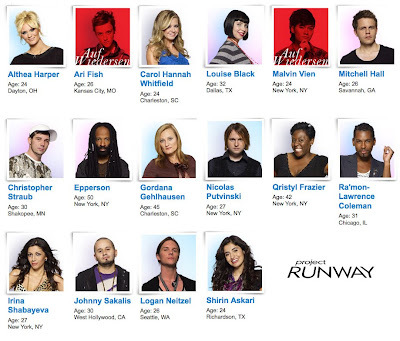 You can even vote for your favorite designer on lifetime after each episode. Unfortunately I can't get the designer's portfolios to work so I will just have to keep waiting to see each designers' personality tonight! How sweet is it that the TWO MINNESOTA DESIGNERS were the TOP TWO! Love it! WOOT! A bit shocked that they kicked off Arie so fast. Crazy but at least interesting! 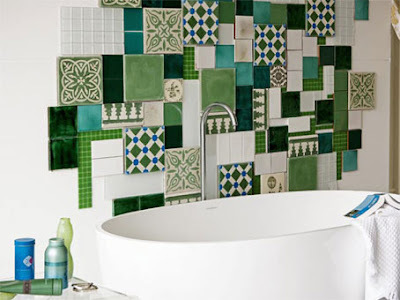 ...have an entire wall filled with overlapping, seemingly mismatched tiles just like this. What a statement it would make, especially with a fabulously simple tub just like that. Dang! 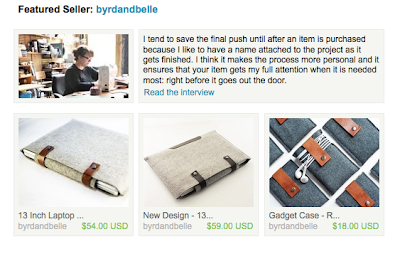 Right now on the Etsy front page is a MN local artist Angie Davis from Byrd and Belle. She has a fantastic business creating eco-conscious bags and sleeves for laptops, and all the gadgets you can carry. I personally love the gadget case, my ipod has been needing a new cover for quite some time now! And of course it is extra awesome because they are created using recycled materials! Fab! The new season of MAD MEN premiered last night and I loved every minute of it. It really set up the drama for the upcoming season. I can't wait to see what each episode reveals- I personally hope Don starts shaping up a little before his new baby arrives! A new design has made into the shop this week! 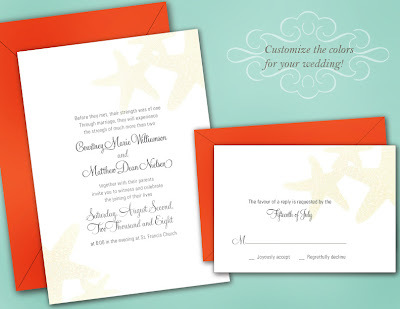 These starfish invitations are sure to be a hit with destination and beach themed weddings and parties! 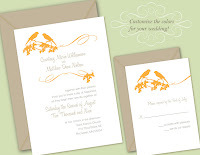 Starfish Wedding Invitations and don't forget the matching save the dates! The tomatoes we planted are finally turning red! 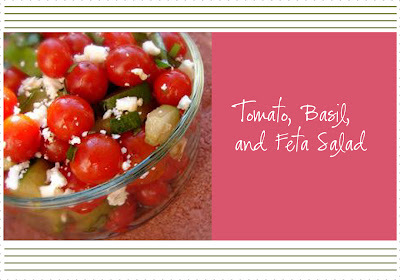 A lot of the cherry tomatoes are red, super good for tossing on a salad... err that is if I ever eat one! We also have roma tomatoes and small hybred tomatoes that are just now turning orange. Pretty soon here we will be engulfed in tomatoes!! If you have any good recipes using these little guys feel free to send it my way! 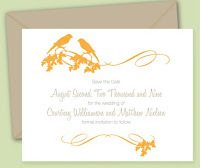 This design is perfect for a beach themed wedding or a destination wedding! 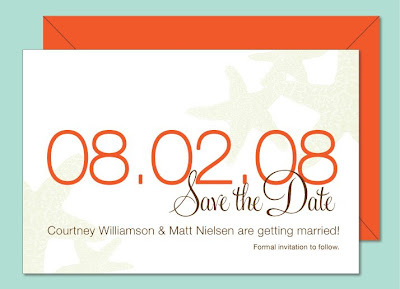 *Don't forget that I am running a special now that when you order invitations you can get the matching save the dates at the same time for a great discount! You can either email me or convo me on etsy to receive a quote! If you haven't stopped by my website in a while you will now see that it is under construction. 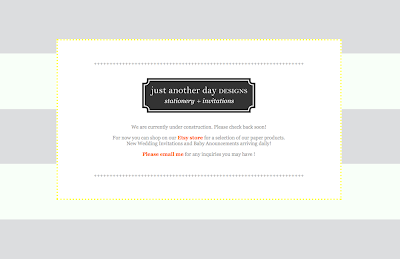 I am working on a new layout with my new stationery and wedding invitations designs. I will update you all with the fabulous progress! A new design in the shop!